This doc is obsolete. Its contents have been incorporated into the slide deck for Intro to W88 Laser Cutter. Please don’t use the laser unless you are certified to do so! It’s a (big frickin’) ~40 watt CO2 laser in a protective cabinet with the ability to direct the laser beam’s XY position anywhere in a 20”x12” area. The infrared laser beam can burn through appropriate materials up to about 1/4” thick, or burn the surface away, engraving detailed images. It is a 2-dimensional imaging device that cuts or engraves only things that have a flat surface. The cutting beam is invisible, so a red guide laser shows where the beam will hit.The control system for the laser is driven from Windows machines over Ethernet. On Windows machines that have the RetinaEngrave 3D software installed, it appears as a printer. Printing to the laser cutter from any Windows application generates a job for the RetinaEngrave application. RE provides a rich collection of options and adjustments to control how the engraving or cutting will occur, and allows the user to start the engraving or cutting job on the laser. Sorry, but this distinction and how they behave is fundamental. You’ll almost certainly need to be familiar with a vector editing tool like Inkscape. You might be able to stumble into a way to cut something without understanding what you’re doing, but we don’t want you stumbling around the laser. The laser is the most dangerous tool in the space. Ways it can kill you or others include: Poisoning with toxic fumes, death by fire and electrocution. The COMPLETELY INVISIBLE beam can blind you or others and cut thru your flesh more easily than thru acrylic. This is not an exhaustive list. Workshop88 premises: The laser cutter burns through materials, so fire safety is critical. Never leave the machine unattended, as material may catch fire while it’s being cut or engraved. Know the location of the fire extinguisher, and verify that it’s actually there. Never operate the cutter without the exhaust system running. Use the air assist when cutting materials that can flame up. Preserving the laser cutter: The cutter is delicate compared to some of our other machines. It has exposed expensive parts: the lenses, mirrors, and laser tube are delicate and expensive. It has expensive parts that wear out: the laser tube will fail after a few hundred hours, and the power supply will need replacement someday. Never run the laser without cooling water circulating in the system. Never run without exhaust. The operator’s safety: Never defeat the cover interlock that prevents the laser from operating with the cover closed. With the cover closed, the cutting beam will not leave the cabinet. The red laser guide beam is capable of injuring your retina (NB: check this) so beware of reflections. The laser tube has a 20,000 V High Voltage power supply in the cabinet which can easily kill you. Do not put your hands near the laser tube unless you know that the machine has been unplugged for at least one hour. The cooling water pump and the exhaust fan MUST be running when the laser is cutting or engraving. The air assist compressor MUST be running when you cut; should also be running when you engrave. 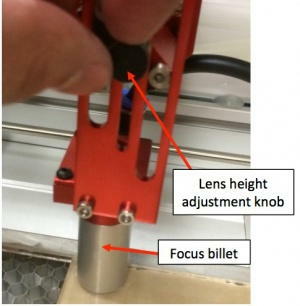 Cutting the wrong materials can produce fumes that can damage the optics. Oh, and kill you. When engraving, the acceleration ramp area must be clear or the gantry can crash. If mirrors get loose and become misaligned, the beam can get loose inside the enclosure and damage anything it hits. YOU ARE RESPONSIBLE FOR WATCHING OUT FOR THESE. Turn it on: the laser, the exhaust fan and the water pump are all on the same switched power strip, currently on the floor on the left side of the cutter. Turn on the power on the strip. You should hear the exhaust blower start running. Home the laser: the control panel on the front of the cutter has a row of touch screen buttons. Use the third button, which has a picture of a house above the letters AF. The description of how to use the control panel can be found in the Retina Engrave User’s Manual. The laser will not cut or engrave if it hasn’t been homed prior to use. Place your material in the cutter. You can place material wherever you like on the honeycomb material. Jog to material: Using the arrow buttons on the front panel, jog the pointing laser to the starting point. The red dot should be at the upper left corner of where you want to cut or engrave. Set focus: The laser has a fixed focal length lens on the carriage that must be at a fixed distance from the material to make the best cuts. To adjust, loosen the thumbscrew on the front of the carriage, then raise the sliding lens carrier. Place the small aluminum cylinder (ToDo: where will this be??) on top of your material under the lens carrier. Lower the lens carrier till it touches the cylinder, then tighten the thumbscrew and remove the aluminum billet. Final lab test is designing and making 2 copies of your own certification certificate – one for you and one for the wall. How about running a class periodically? Entrance requirement is raster/vector understanding and being able to use some vector image editing tool. This would allow us to go thru all the dumb RE stuff once instead of individually with each person. I (jw) think part of how we slant/color the doc should reflect that our users/readers are expected to be fairly technical. We’re not running a laser shop for dummies . We’re just providing an introduction for people who haven’t been exposed to this stuff yet. This thought came up while trying to decide about including a discussion of the air assist’s fire prevention purpose while talking about fire safety and the laser. My conclusion was yes, explain to these technical people about what air assist does. Where to post speeds and feeds for the common approved materials? This doc? The main laser doc page? Someplace we need to talk about cleanup. It’s pretty critical to take the honeycomb out and sweep up the bit you’ve cut out. That’s not just a neatness thing – it’s so the honeycomb sits flat on the bottom. Probably also something about managing the scrap. One person’s cutoff is another person’s raw material. OK – a 1/2″ square probably isn’t worth saving, but I’ve seen lots of cutoffs thrown out that should have gone in a scrap material bin for use by someone else later.